Answer: You can connect a modem to one of the serial ports for dial-up access. We have uploaded the user manual for your convenience, it details the setup and configuration steps. 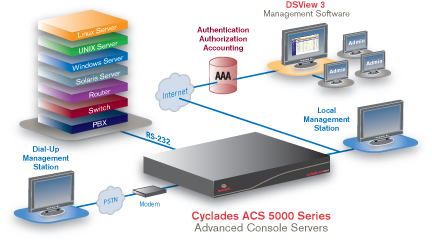 The Avocent ACS5032-001 is compatible with multiple cisco consoles. Compatibility and connections would depend on which Cisco console you have - for specific device compatibility, I would recommend contacting Avocent Technical Support at 1-888-793-8763. Question: what is the airflow of this device? The Avocent ACS5032 vents exhaust air to the sides. The unit typically consumes 0.15A 18W, and can consume up to a maximum of 0.3A 36W (100-240 VAC @ 50/60 Hz). If you would like more specific information about Avocent ACS5032 Airflow management, please feel free to contact your KVM Switches Online sales representative directly. Question: What is the ECCN for ACS5032? 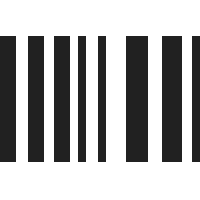 The ECCN (Export Control Classification Number) for Avocent ACS5032-001 is 5A992. Question: I need a Test Report for the following ACS5000 series. I know that this has been discontinued but the country we sent this too needs a Test Report. Can you help me. Answer: Thank you for your inquiry. Unfortunately we do not currently have any testing documents available for this particular product. Without knowing which specific test report you are looking for, your best bet will be to contact the manufacturer directly via email at support.avocent@vertivco.com or via phone at 1-888-793-8763.